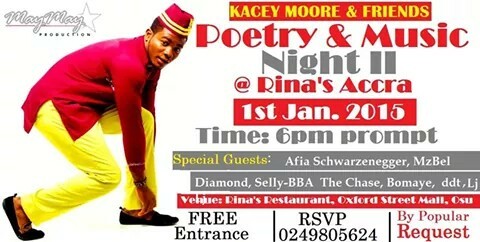 By popular request, the Kacey Moore & Friends Poetry and Music Night returns on 1st January 2015. Venue is still Rina’s Accra Oxford Street Mall, Osu. Time is 6pm.Special Guests : Afia Schwarzenegger, MzBel, Diamond, Selly- BBA The Chase, Boomaye (BBA), DDT and Lj of “Abrofosem” fame. FREE ENTRANCE for everyone. Come and enjoy beautiful Live Music and Great Poetry.